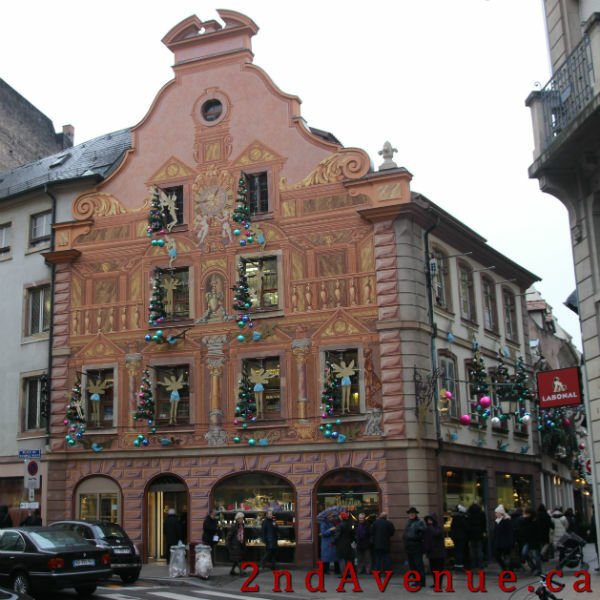 There’s good reason for Strasbourg to bill itself as the Christmas Capital (capital de Noël). Starting in late November every year, the city is taken over by holiday decorations, almost a dozen different markets, and millions of visitors. We arrived in Strasbourg on the first weekend the markets were open and made the mistake of starting at the busiest and biggest market on our first night. It was overwhelming. People pressed shoulder to shoulder, jostling each others’ vin chaud (hot spiced wine), competing to purchase Alsatian snacks, and craning to peer at the variety of Christmas trinkets for sale. Crowded with competing noises and lights and smells, there was definitely no sense of holiday ‘peace and goodwill’ at Place Broglie! After a round of vin chaud and a quick bite, we retreated from the Christkindelsmärik and stumbled on the light show at Place Kléber, Strasbourg’s largest square. We struggled to follow the story behind the show, but the lights and sounds were sufficiently impressive for the plot to be entirely unnecessary. The press of the people continued, however, and we called it a night. We returned to our accommodations somewhat disillusioned, slightly agoraphobic, and more than a little worried that the markets might overwhelm Strasbourg’s charm. Why did it seem like a good idea to join the more than 2 million tourists who visit la Capitale de Noël over a five week span? What were we thinking becoming part of the holiday hordes? Could this be Christmas overdose? Thankfully, a late night dog walk that first night revealed a quieter, less frantic side to Strasbourg at Christmastime. The markets close relatively early (8pm on weekdays/9pm on weekends) and the city quickly emptied leaving only a few pedestrians and lots of glittering lights. We found what may be the prettiest, glittery-est little street in the world between Temple Neuf and the Cathedral; strolled along the Ill River while watching the lights flicker on the water; enjoyed the unimpeded views of the half timbered houses of Petite France; and reveled in the peaceful quiet of the decorations. This was the magic I had hoped for! On subsequent days, we sought out a few of the quieter markets and Strasbourg’s charm returned. Without the overcrowding, we were able to linger over locally-produced goodies and intricate toys, chat with vendors, and enjoy our drinks without fearing that some stranger’s misplaced elbow would spill them. Strasbourg proved itself worthy of its self-anointed ‘Christmas Capital’ title, but it was only by getting a little off the beaten path (or the worn cobblestones – ha!) that we were able to really enjoy what the city has to offer. Move beyond the Cathedral and Christkindelsmärik and explore the further flung, less crowded markets – which really aren’t that far! The official program has a map of all the markets. 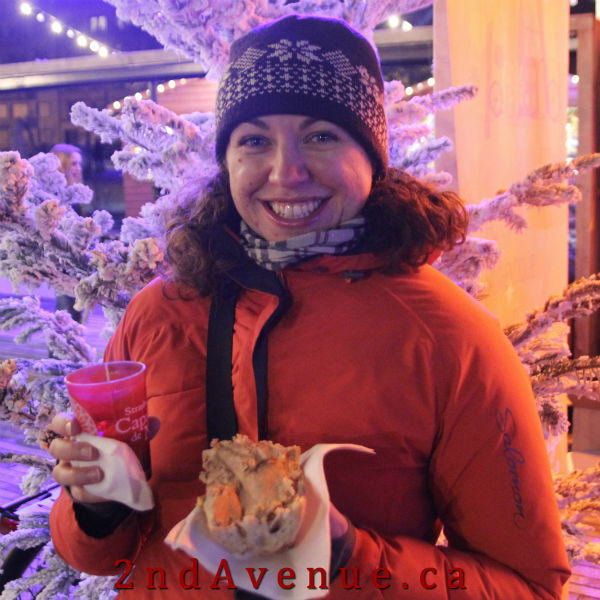 A mug of vin chaud and foie gras – happy eats! Strasbourg has a fabulous mix of French- and German-inspired chow and there are likely a few things you haven’t eaten before. Sauerkraut (choucroute in Alsace) with bacon (lardons) and pasta-like dumplings (schupfnudeln)? Yum! Chestnuts – roasted or candied (marron chaud or glacé)? Not my favourite, but I’m glad to have tried them! Fresh bread with a large smear of foie gras? Ohhh yes! No matter how rusty you think your French is, give it a go! The vendors seemed to really happy to start a conversation in French, although almost all of them quickly switched to English. Many people in the region also speak German, so if Sie sprechen Deutsch, that also works. Know what you want beforehand (generally the offerings are well-posted), hold off on the small talk, and save your broken French for later. When the lines are 30 people deep, efficiency is key! Strasbourg is flat and all the markets but one are within reasonable walking distance. The easiest, cheapest, and often quickest method of transportation is hoofing it. At least you can take a warm mug of wine for the journey! It’s winter. The markets are all outside. Hot wine can only keep you toasty for so long. Many of the high-end stalls selling clothing, art, and decorations take international credit cards (and European bank cards), but food is pretty much a cash only exchange. The vendors really appreciate getting coins or exact change early in the day, but most are fine with breaking 50 € notes later in the day. Strasbourg has lots to see beyond the markets: historical churches, chic department stores (Galeries Lafayette and Printemps), EU institutions, and a wine cellar at the City Hospital (link in French). In addition to escaping the crowds, these can be great places to warm up as well! Decorations were impressive in daylight – but magical at night! Strasbourg was at its most magical after the markets closed. 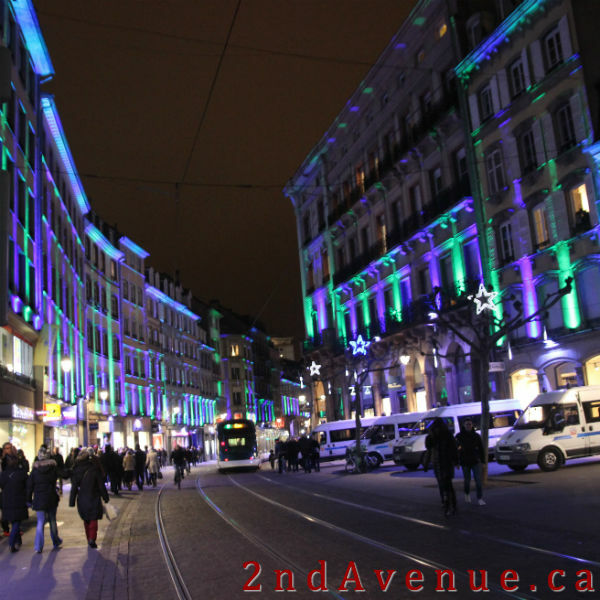 Take an after dinner walk through Petite France to the picturesque Ponts Couverts; stroll under the huge chandeliers on Rue des Hallebardes; or enjoy the changing multicoloured lights that illuminate the buildings on Rue des Grandes Arcades. The holiday lights in Strasbourg are fantastic and some of my favourite moments in the Capital de Noël were after market hours. And a bonus tip: You can return the reusable cups to any drink stall to get your 1 € deposit back; no need to seek out the stall you bought your beverage from. Feel free to stroll between markets with your beverage without worrying that you’ll need to backtrack to return your glass. Belgium is the featured region at this uncrowded market on place Gutenberg. 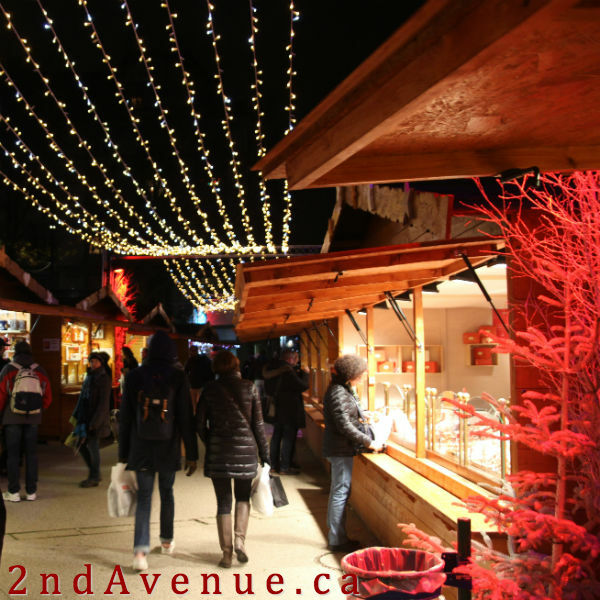 The beer, chocolates, waffles, and fries are all as delicious as expected and the square lights up beautifully with changing colours at night. Located outside the dense historical centre of Strasbourg on the place d’Austerlitz, this market features regional meats (like foie gras and sausage), baked goods (so many cookies! ), and wine – including fantastic vin chaud blanc. Tucked alongside the Petit France region of the city on place des meuniers, this rustic market has local producers promoting their own edible delicacies. The pride the sellers felt in their wares was evident and it was reflected in the quality of the food and beverages. And who doesn’t want to support ‘invincible’ artisans!?! A lovely smaller market at place du Temple neuf with the standard market fare (vin chaud, sausages, trinkets, toys) along with a large tea stall and the only marrons glacés (candied chestnuts) I saw in Strasbourg. These few stalls next to the giant Christmas tree on the place Kléber are the feelgood section. Home-baked goods and charitable organizations make this a great do-gooder stop. Perhaps the smallest market, these stalls in place Benjamin-Zix offer gifts, toys, and other mostly non-edible purchases. Great to tie together with a visit to the Market of Invincible Small Producers. Set up around Strasbourg’s Cathédrale Notre-Dame on the place de la Cathédrale is a fairly standard Christmas market with beautifully lit streets leading up to it and the towering Cathedral spires above. A small market with at place du Corbeau with mostly ornament and decoration stalls. A nice stop on the walk between the Market of Alsatian Christmas delights at Austerlitz and the Belgian Village or Cathedral Market. Just for kids, this market on place Saint Thomas seemed to really be a tent for holiday crafts. It was closed when we were there so it’s hard to tell what it was liked when filled with children. Cool wooden carvings around the tent, though. On the place Broglie, this is the largest (and most overwhelming) of Strasbourg’s markets. There’s the standard assortment of food and beverage sellers along with many stalls hawking souvenirs, art, housewares, and gifts. We didn’t actually make it to place de la Gare for what is apparently the least-toursity market in Strasbourg. I really like both Metz and Strasbourg 🙂 I hope you like it, too! Thanks for the tips! I had no idea Strasbourg called itself the Christmas Capital!! 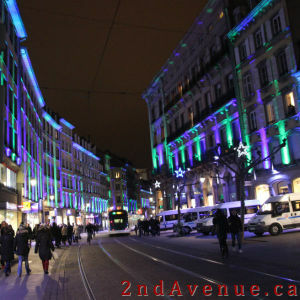 I love experiencing that Christmassy feel, so I will definitely have to look into going there next Christmas. Strasbourg has certainly nailed the Christmassy feel 🙂 If you do go, I hope you have a wonderful time and that this year’s theme is as fun (and delicious) as the 2014 Belgian focus!